This upcoming weekend is a busy one, and there may be some hard decisions for you guys wanting to watch as many finals as possible. But those are first world problems, people, so quit your complainin’. 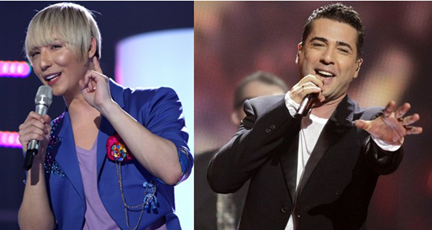 If you’re someone who has always wanted to see a singer make the transition from Junior Eurovision to adult, might I suggest the final in which that may actually happen – Serbia’s Beosong. Opening the 15-strong semi final on Saturday night will be a trio made up of, among two others (duh) Nevena Božović, who represented her country at JESC 2007 and ended up in 3rd place. Even if you don’t give a failed backup dancer’s two left feet about JESC alumni, you should be interested in watching Beosong, because let’s face it: Serbia have never sent a bad song to Eurovision. * Sure, their history only extends back to 2007, giving them less opportunities to have royally screwed up…but plenty of other relative newcomers to the contest have proven themselves inconsistent (or consistently rubbish) when Serbia has not. In light of that, and the fact that entry number seven is on its way, let’s take a look at that short but sweet history while you’re deciding whether or not to take my advice and watch Beosong. Or just watch it of your own volition. * This is my opinion, of course. But if you disagree, YOU ARE WRONG, WRONG, DAMMIT! My favourite entry Ovo Je Balkan by Milan Stanković (2010)/ Nije Ljubav Stvar by Željko Joksimović (2012). It still makes me weep a little that Milan didn’t make the top 10, by that much (which wasn’t actually that much, I suppose, but enough to mourn the loss). OJB was and still is everything I look for in a Eurovision song – it’s ethnic, catchy, fun, and allows you to dance on your kitchen table without looking completely stupid. Not to mention the performance, which opened my eyes to a whole new world of bubble-wrap wear. It doesn’t get much better than that, which is why I have to tie it, not better it, with Željko’s latest piece of genius for Serbia. This song was basically all I love about his compositions stuffed into three minutes, albeit stuffed in a very elegant way. Epic, atmospheric Balkan ballads are my weakness, and nobody does them like ZJ (except maybe Regina). I can’t pick between their songs, but I can tell you who has the better haircut. My least favourite entry As you may have gathered from the intro, those words do not compute with me where Serbia is concerned. I can’t pick one. I have loved everything they’ve ever sent, and if we were factoring in Serbia and Montenegro’s entries as well, that would not change. If we were factoring in just Montenegro…well, let’s just say two heads republics were better than one. But Serbia has the magic touch. Čaroban. Molitva by Marija Šerifović (2007) – winning Eurovision on your first go as an independent nation? Now that’s something to impress your friends with at dinner parties. Marija’s victory was unexpected and proved that English isn’t always the best bet for success. Ya hear that, Iceland? Oro by Jelena Tomašević (2008) – knock, knock, who’s there? Why, it’s Željko again! He worked his magic for the third time on home turf, also finding time to co-host the show. Jelena did him justice, and gave the dry ice machine industry a real boost. Cipela by Marko Kon & Milaan (2009) – this came so close to qualifying it isn’t funny (honestly, this not making the final was the most upsetting event of 2009) but I have consoled myself by playing it to death over the years. Their best stage show Čaroban. If you’ve got a retro-sounding song, you may as well run with it. The Serbian delegation went all out in Düsseldorf, matching their costumes, choreography and slightly nauseating backdrop to their Sixties-inspired number. That was what I call entertaining. Their best costume/s Marija Šerifović and the Beauty Queens. Is red, white and black not THE greatest colour combo on the planet? These ladies made me want to hire a suit for my school ball that year. I reckon if they’d worn double denim or something, they wouldn’t have won anything, unless it was the Barbara Dex award. I dig the ‘feminine groomsman’ look. Their best vocalist/s Marija Šerifović. It really all came together for her, didn’t it? Her voice was great, but it was the emotion that made it greater. You’d never guess she’d sung it too many times to count during rehearsals and whatnot; it was like she was feeling every lyric for the first time. *Insert mock-vomiting here*. So, will you be watching Beosong this weekend? Which Serbian entry has been your favourite so far?